Lunch and Learn: He Said, She Said – Now What? 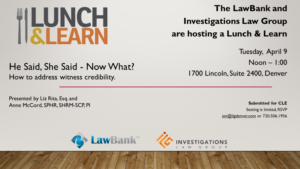 Join Investigations Law Group and LawBank for a Lunch and Learn on Tuesday, April 9th from noon – 1:00 pm!! He Said, She Said – Now What? How to address witness credibility. Presented by Liz Rita, Esq. and Anne McCord, SPHR, SHRM-SCP, PI. Submitted for CLE approval.